What does it profit a man to be able to eat at an integrated lunch counter if he doesn’t earn enough money to buy a hamburger and a cup of coffee? ~ Rev. Martin Luther King Jr. In honor of the Reverend Martin Luther King Junior and in conjunction with the Federal holiday bearing his name, Evaero will take a break from precision CNC machining and close down for the day on January 15th. Although this year will see a dramatic uptick in the number of employers providing a paid day off for Martin Luther King Jr. Day, (from 37 percent to 43 percent) sadly only 14 percent of manufacturing companies will offer it up as a holiday like Evaero will (Bloomberg BNA). Evaero exists on very slim margins which makes me keenly aware of the sacrifices that have to be made to close a manufacturing company down for a day. Given that we use the time between Christmas and New Years to make major facilities repairs, the last thing our income statement needs in January is a day we’re not making and shipping parts. Nevertheless, in recognition of the sacrifices MLK made for the disenfranchised, disadvantaged, and destitute, I choose to shut the business down for the day so I and the team can take some time out to honor his life and legacy. I expect many will treat MLK Day as “just another three-day holiday” and I think that’s a real shame not just because of the critical role he played in the Civil Rights Movement, but because of his fight for workers’ rights and the working poor. Indeed many of the themes he expounded upon towards the end of his life are just as relevant now as they were then such as income equality and the dignity of workers. So often we overlook the work and the significance of those who are not in professional jobs, of those who are not in the so-called big jobs. But let me say to you tonight, that whenever you are engaged in work that serves humanity and is for the building of humanity, it has dignity, and it has worth. Do you know that most of the poor people in our country are working every day? And they are making wages so low that they cannot begin to function in the mainstream of the economic life of our nation. These are facts which must be seen, and it is criminal to have people working on a full-time basis and a full-time job getting part-time income. In his own life’s example, he symbolized what was right about America, what was noblest and best, what human beings have pursued since the beginning of history. 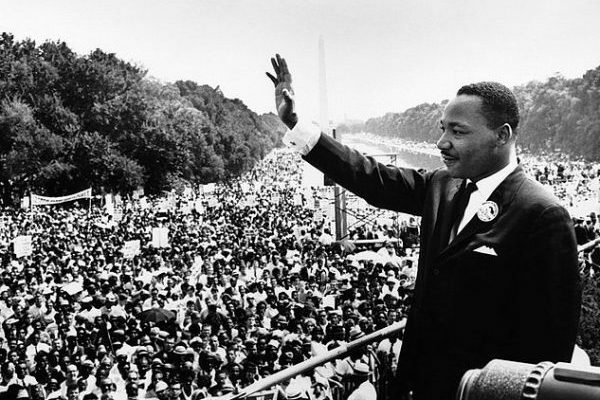 Whether you are African-American, Hispanic or Native American, whether you are Caucasian or Asian-American, you are part of the great dream Martin Luther King, Jr. had for America.This is not a black holiday; it is a peoples’ holiday. I couldn’t agree more which is why along with my son and wife, we will be taking part of the day to celebrate the life and legacy of Martin Luther King Junior. What about the rest of the day? In conjunction with MLK Day and as part of the Tucson Jazz Festival, there will be a “Jazz Fiesta” on that day featuring free jazz on eight stages all over downtown Tucson. Totally pumped. Some family time, great music, and (hopefully) great Tucson weather…what more could I ask for? The festival is a whopping two weeks long and in a short time has become a destination for jazz fans across the country (50 percent of the ticket buyers are from out of town). Some world-class acts coming this year include: Hypnotic Brass, The Hot Sardines, Arturo Sandoval, Sheila E., Lew Tabackin, Diane Schuur, Spyro Gyra, Wycliffe Gordon and Jay Leonhardt. Who to leave with you today? Since I’ll be seeing her on Sunday night at my favorite venue in Tucson, The Rialto Theater, how about the incomparable Sheila E.? Off of her new album Iconic here is a preview of the song “Everyday People” featuring the man himself Freddie Stone. Stone of course, was the co-founder, lead guitarist and singer of Sly and the Family Stone and I will be sure to also some of his music to our Spotify playlist.